Sony Music Kids, the Kids division by Sony Music, today announced the release of Volume 2 of Bachcha Party - a collaboration of musical talents to create original, engaging and appealing songs for kids and their parents alike. This series of 7 songs has been written and composed by Ankur Tewari and produced by Sidd Coutto, both known to create music that connects with music aficionados instantly. All songs under Bachcha Party are based on themes that are a part of a child's day-to-day life. Friday June 1st will see the video release of the song #MeraSunday, a song that's about children wanting to reclaim their Sundays to do "absolutely their own thing". Adults can also instil their tedious weekdays with Sunday moments, with the #RozManaaoSunday idea being used heavily in social media to promote the song. Says Anjana Devraj - Head Kids, Sony Music India, "As a label, we believe there is a massive gap for rich original musical content for kids in India and Bachcha Party was conceptualised to fill that gap. This album of original hindi songs with Ankur will be a sure-fire hit with Kids and Parents alike, as the songs are really catchy. Ankur has the ability to connect with audiences with his wonderful lyrics drawn from themes that are most relevant to children, and fun melodies that stick with you." Adding on Ankur Tewari says, "The response that I got for creating Kids songs with Sony Music, from my friends and from people in the industry, was very encouraging. I believe the music and lyrics across these Bachcha Party songs will appeal to adults as well, and the #MeraSunday music video is something that people across the globe will relate to. I hope music fans enjoy listening to Bachcha Party along with their kids, their friends and families. 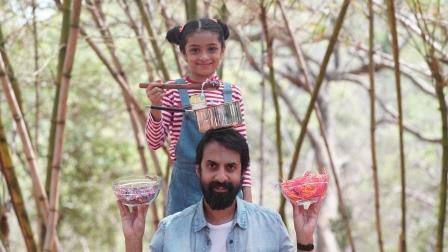 The video has been conceptualized, directed and produced by Shaizad Bharucha (ex-Disney, ex-MTV), and shows a little girl spending her Sunday the way she wants to, doing some of her favorite things, while contrasting Ankur's position as an adult who's with her, mostly as a prop to facilitate her being able to do her favorite things.